7 Billion Humans on iPad and iPhone next Thursday Dec 6! ATTENTION ALL HUMANS! Get your 70 billion fingers cracking and ready to swipe! 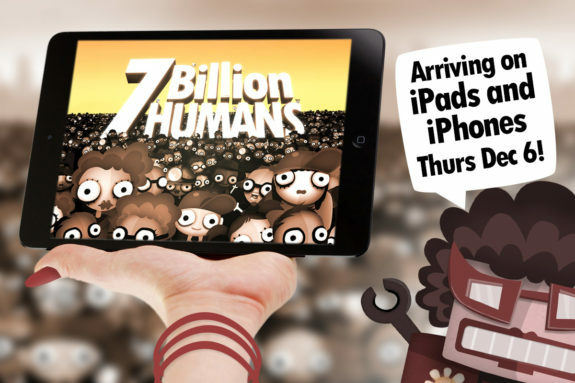 7 Billion Humans is coming to iOS devices everywhere next Thursday, Dec 6! Available as a Universal App (which means a single purchase works on your iPads and iPhones), you can automate your swarms of workers on any device with iOS 10 and higher. And thanks to our community translators, the game will be available in 13 languages: English, French, Italian, German, Spanish, Dutch, Polish, Brazilian Portuguese, Russian, Traditional Chinese, Simplified Chinese, Korean, and Japanese. More info, video, trailers, and screenshots are here. See you next Thursday! Nintendo Switch gets 7 Billion Humans today! Boot up your Nintendo Switches and make room for 7 billion new friends! 7 Billion Humans is now available on Nintendo Switch – in all regions worldwide! Play using either gyroscopic pointer controls or touch screen. English, French, Italian, German, Spanish, Dutch, Polish, Brazilian Portuguese, Russian, Japanese, Traditional Chinese, Korean. More info from Nintendo here! Thanks everyone for waiting while we made the Switch version as perfect as possible! And happy programming! 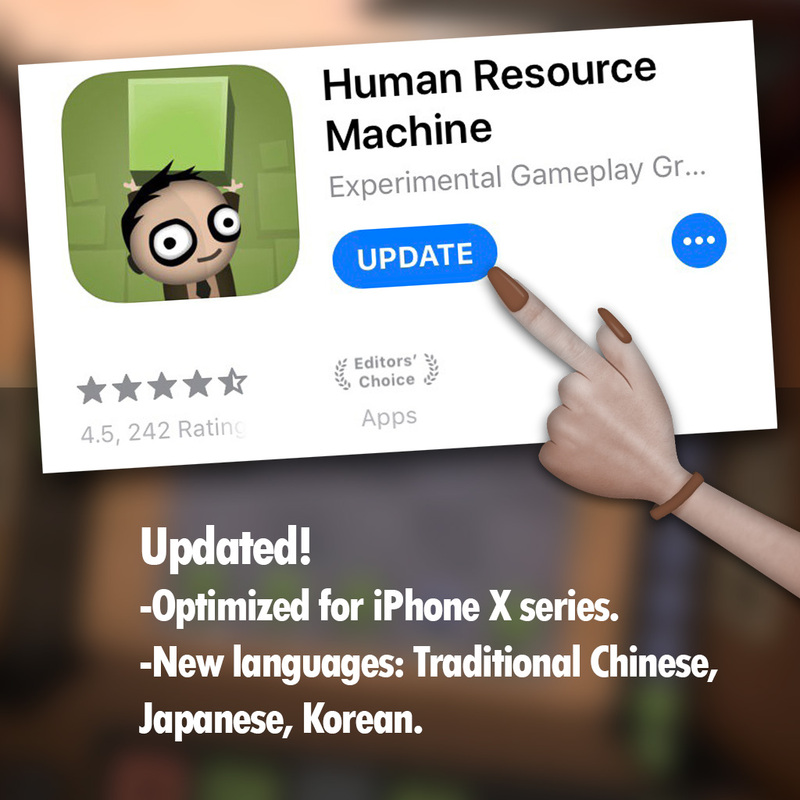 Human Resource Machine on iOS has been updated! Swipe open that device, and get 3 more languages for our friends in Asia (Korean, Japanese, Traditional Chinese) and optimized support for all the new Apple devices. We Have a Nintendo Switch Release Date for 7 Billion Humans! Excellent news from the great Mushroom Kingdom! They have approved 7 Billion Humans for release on Nintendo Switch THIS MONTH on Thursday, October 25! They also have a nice new feature that didn’t exist last time we launched a game. You can now pre-purchase games on Switch. So we’ve made 7 Billion Humans available for pre-purchase starting on October 18 – one week before launch. How efficient! Thanks everyone for being patient while we worked our way through the twisty system of pipes at Nintendo, and more info coming soon!